ISBN 9780194070256. 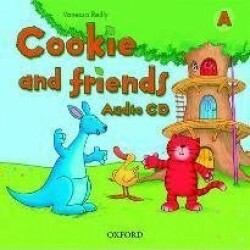 Contains teacher's materials for Cookie and Friends Starter, A and B..
ISBN 9780194592932. Cookie's Nursery Rhyme Video is an animated film for children learning English. Cookie is the cat, Lulu the kangaroo and Densel th..